Mary Aiken, who is completing her PhD in forensic cyberpsychology at Middlesex University, is the inspiration behind the latest Crime Scene Investigation TV spin-off CSI:Cyber. Currently airing on CBS primetime in the US, the pilot of the show broke a Guinness World Record for the largest TV drama simulcast when it was shown in 171 countries simultaneously – providing incredible exposure for Mary's field of research. Mary (above right, alongside Patricia Arquette. Photo: CBS) first came to the attention of TV bosses when she presented on human trafficking at the White House in 2013 in her role as director of the Cyber Psychology Research Centre in Dublin. With an increasing percentage of crimes involving computer activity, Mary's expertise is in high demand and she frequently provides advice to major crime-fighting agencies including INTERPOL, the Metropolitan Police and the Los Angeles Police Department on areas such as cyber security, cyber stalking and virtual behavioural profiling. Speaking to the New York Post earlier this year, she shared her amazement at being approached by CBS. "Nobody was more surprised than me when I was invited to CBS," Mary said. "I'm very passionate about my discipline and my research in the area, but I never thought my work would inspire a lead character in a prime-time CSI show." Not only has the show been based on her, in Mary's role as a producer she is heavily involved in the script-writing process, which draws from real-life examples of cybercrime. As a result, she sees huge educational value in the TV show. "The attraction for me was [that] this is an incredible platform to reach out to people and to talk to them about cybersecurity and cyber safety messaging," she told the Post. "I'm hoping that each programme becomes a conversation piece in the home for […] parents to talk to kids about the use of their devices and, more importantly, for kids to talk to their parents about security online." Co-director of the Centre for Abuse and Trauma Studies (CATS) Professor Julia Davidson, who is supervising Mary's PhD along with Senior Lecturer in Criminology Elena Martellozzo, told Middlesex University: "Mary's research is groundbreaking and will aid police in the investigation and prevention of online child abuse. "CATS is becoming recognised as a hub for national and international research in cyber abuse and cybercrime. It's fantastic that our PhD research is at the forefront in this area and that Middlesex's expertise in this exciting new field is gaining mainstream recognition." With interest in cybercrime growing among students, Professor Davidson and Dr Martellozzo hope to launch a master's in cybercrime in 2016. 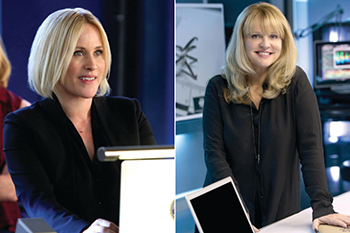 And, for those in the UK keen to see Mary's character on the small screen, Channel 5 has announced it will be airing CSI:Cyber later this year.